Is your nose giving you away? Pinocchio, as you probably know, was a puppet and each time he told a fib his nose would grow. Well, it’s not just in fairy tales that our noses can give us away! 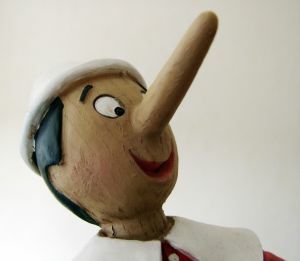 When we lie, blood fills the vessels in the nose causing a tiny Pinocchio like effect. Along with this comes an itchiness and so we rub our noses. And a nose rub may indicate a lie! To get a free download of ‘How to Tell if Someone is Lying’ simply click here!